We’re appealing for your help to locate a man in connection to a burglary in Horley and an assault on two police officers. 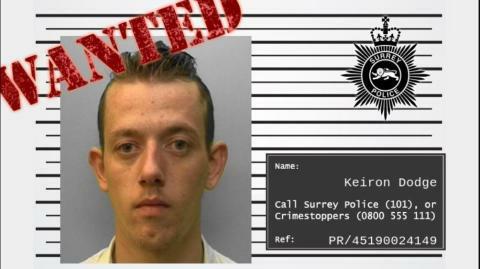 25-year-old Keiron Dodge from Redhill is described as white and around 5ft 9ins tall with brown hair. Dodge is thought to have links to east Surrey, Hastings and Hackney. The burglary happened at around 8pm on Wednesday (6 March) at a property on Benhams Drive where jewellery, a laptop and a car were stolen. The stolen car was driven off by Dodge and another passenger. It was then spotted around 40 minutes later, waiting at a red light on a junction on the M25. After a short pursuit, officers arrested the passenger, a 23-year-old woman from Hackney, on suspicion of burglary and possession of a class B substance. She has since been released under investigation. The driver of the car, Dodge, assaulted two police officers and then fled the scene. Both officers’ injuries are not serious.